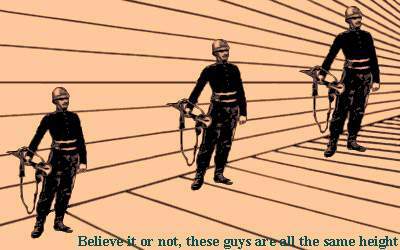 OPTICAL ILLUSIONS: A collection of images that fool the eye and mind. The gray lines between the rows of boxes are actually straight even though they look wavy. As you look at the corners where the intersections of the gray lines, the ones near the center of your field of view look white while those further away look darker. Moving your eyes around will make the dots flash bright and dark. Although the open center circle on the left looks slightly smaller than the one on the right they are both the same size. The corner intersections are white, even though they appear a faint gray. Even though the top line looks longer than the bottom one, they are both the same length. All the red boxes are the same color, even though the ones on the bottom appear darker. 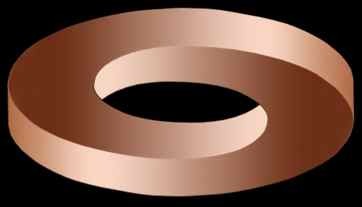 Focus on the black dot in the center of the rings and lean forward and backward, the rings will appear to rotate in opposite directions. Lean close the screen and focus on the red circle as you count to 60. Then close your eyes and you'll see a green circle where the red dot was. 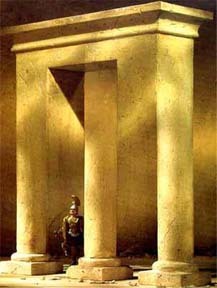 This uses a different effect than the previous illusions, in fact it isn't an illusion at all. What happens is that as you stare at the red dot your eye adapts to the color red. After awhile it develops a temporary bias against red. When you then close your eyes they over correct and you see the opposite color: green. This is similar to the loss of sensation we feel when something presses against our skin with constant pressure and without movement against. After awhile the nerves adapt to the sensation and we no longer feel it. But, when the pressure is removed we feel a spring-back or opposite sensation even though there isn't any stimulation occurring. 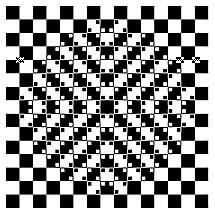 The following illusion gives you three illusions in one picture: the lines look curved, the squares look different sizes and the surface appears to bulge outward. As you look at the next image the outer circles will appear to rotate clockwise while the inner circles move in the opposite direction. The effect is enhanced by letting your eyes roam around the picture. This picture works in a similar manner. Moving your eyes right and left increases the rolling-wave effect. This trick can be used to create 3D images of planets. A popular one is using two images of Jupiter taken half an hour apart. The slight rotation of the planet shifts details on the surface so that the image appears three dimensional. Click here to go to my main page and browse 80 other topics: everything from magnetic rocket engines and Knitting Nancies to the strange world of lucid dreaming.